Matt Marczel pitches a more traditional style of sweater for the Flyers today. By the way, have you picked up on this week's subtle theme yet? The Springfield Falcons' offseason affiliation change has left them still wearing Blue Jackets jerseys while growing future Coyotes players. Matt Marczel has a simple solution to fix this — just change the colors on the Falcons logo. Matt Marczel wanted to freak us out today. Keep looking. You'll see it. Sharks fans already did. In reality, though, Matt says he was inspired by the San Jose Sharks' AHL affiliate — the Worcester Sharks, who wore these theme jerseys in November. With the Sochi Olympics behind us, is it too soon to wonder what will Team USA wear in South Korea in 2018? Matt Marczel submitted this concept with a new futuristic crest. 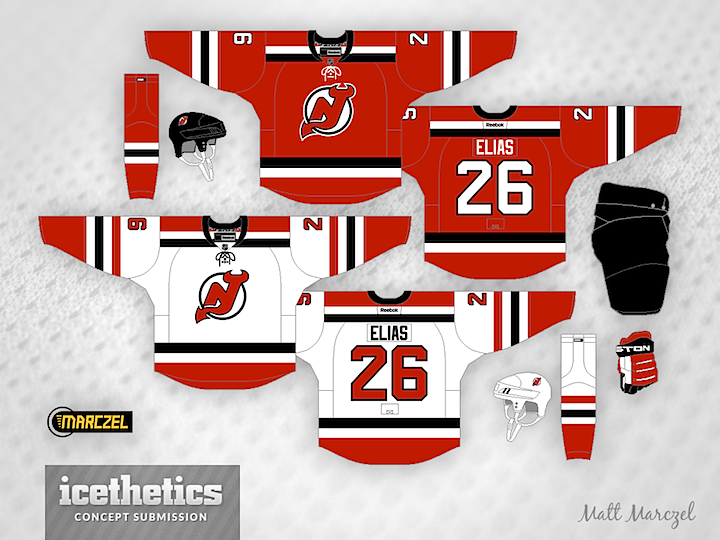 If the New Jersey Devils are ever tapped for a Winter Classic, will they just wear the standard red and green? Or could they pull a Rangers/Flyers and go faux retro? If it's the latter, Matt Marczel may have hit the nail on the head.